Ludwig Wittgenstein’s Philosophical Investigations is a nice piece of work where he attempts to explain his views on language and the consequences of this view on various subjects like logic, semantics, cognition, and psychology. I’ve mentioned some of his views very briefly in a couple of earlier posts, but I wanted to delve into his work in a little more depth here and comment on what strikes me as most interesting. Lately, I’ve been looking back at some of the books I’ve read from various philosophers and have been wanting to revisit them so I can explore them in more detail and share how they connect to some of my own thoughts. Alright…let’s begin. He opens his Philosophical Investigations with a quote from St. Augustine’s Confessions that describes how a person learns a language. St. Augustine believed that this process involved simply learning the names of objects (for example, by someone else pointing to the objects that are so named) and then stringing them together into sentences, and Wittgenstein points out that this is true to some trivial degree but it overlooks a much more fundamental relationship between language and the world. For Wittgenstein, the meaning of words can not simply be attached to an object like a name can. The meaning of a word or concept has much more of a fuzzy boundary as it depends on a breadth of context or associations with other concepts. He analogizes this plurality in the meanings of words with the relationship between members of a family. While there may be some resemblance between different uses of a word or concept, we aren’t able to formulate a strict definition to fully describe this resemblance. One problem then, especially within philosophy, is that many people assume that the meaning of a word or concept is fixed with sharp boundaries (just like the fixed structure of words themselves). Wittgenstein wants to dispel people of this false notion (much as Nietzsche tried to do before him) so that they can stop misusing language, as he believed that this misuse was the cause of many (if not all) of the major problems that had cropped up in philosophy over the centuries, particularly in metaphysics. Since meaning is actually somewhat fluid and can’t be accounted for by any fixed structure, Wittgenstein thinks that any meaning that we can attach to these words is ultimately going to be determined by how those words are used. Since he ties meaning with use, and since this use is something occurring in our social forms of life, it has an inextricably external character. Thus, the only way to determine if someone else has a particular understanding of a word or concept is through their behavior, in response to or in association with the use of the word(s) in question. This is especially important in the case of ambiguous sentences, which Wittgenstein explores to some degree. Some of what Wittgenstein is trying to point out here are what I like to refer to as the inherently probabilistic attributes of language. And it seems to me to be probabilistic for a few different reasons, beyond what Wittgenstein seems to address. First, there is no guarantee that what one person means by a word or concept exactly matches the meaning from another person’s point of view, but at the very least there is almost always going to be some amount of semantic overlap (and possibly 100% in some cases) between the two individual’s intended meanings, and so there is going to be some probability that the speaker and the listener do in fact share a complete understanding. It seems reasonable to argue that simpler concepts will have a higher probability of complete semantic overlap whereas more complex concepts are more likely to leave a gap in that shared understanding. And I think this is true even if we can’t actually calculate what any of these probabilities are. Now my use of the word meaning here differs from Wittgenstein’s because I am referring to something that is not exclusively shared by all parties involved and I am pointing to something that is internal (a subjective understanding of a word) rather than external (the shared use of a word). But I think this move is necessary if we are to capture all of the attributes that people explicitly or implicitly refer to with a concept like meaning. It seems better to compromise with Wittgenstein’s thinking and refer to the meaning of a word as a form of understanding that is intimately connected with its use, but which involves elements that are not exclusively external. We can justify this version of meaning through an example. If I help teach you how to ride a bike and explain that this activity is called biking or to bike, then we can use Wittgenstein’s conception of meaning and it will likely account for our shared understanding, and so I have no qualms about that, and I’d agree with Wittgenstein that this is perhaps the most important function of language. But it may be the case that you have an understanding that biking is an activity that can only happen on Tuesdays, because that happened to be the day that I helped teach you how to ride a bike. Though I never intended for you to understand biking in this way, there was no immediate way for me to infer that you had this misunderstanding on the day I was teaching you this. I could only learn of this fact if you explicitly explained to me your understanding of the term with enough detail, or if I had asked you additional questions like whether or not you’d like to bike on a Wednesday (for example), with you answering “I don’t know how to do that as that doesn’t make any sense to me.” Wittgenstein doesn’t account for this gap in understanding in his conception of meaning and I think this makes for a far less useful conception. Now I think that Wittgenstein is still right in the sense that the only way to determine someone else’s understanding (or lack thereof) of a word is through their behavior, but due to chance as well as where our attention is directed at any given moment, we may never see the right kinds of behavior to rule out any number of possible misunderstandings, and so we’re apt to just assume that these misunderstandings don’t exist because language hides them to varying degrees. But they can and in some cases do exist, and this is why I prefer a conception of meaning that takes these misunderstandings into account. So I think it’s useful to see language as probabilistic in the sense that there is some probability of a complete shared understanding underlying the use of a word, and thus there is a converse probability of some degree of misunderstanding. A second way of language being probabilistic is due to the fact that the unique meanings associated with any particular use of a word or concept as understood by an individual are derived from probabilistic associations between various inferred causal relations. And I believe that this is the underlying cause of most of the problems that Wittgenstein was trying to address in this book. He may not have been thinking about the problem in this way, but it can account for the fuzzy boundary problem associated with the task of trying to define the meaning of words since this probabilistic structure underlies our experiences, our understanding of the world, and our use of language such that it can’t be represented by static, sharp definitions. When a person is learning a concept, like redness, they experience a number of observations and infer what is common to all of those experiences, and then they extract a particular subset of what is common and associate it with a word like red or redness (as opposed to another commonality like objectness, or roundness, or what-have-you). But in most cases, separate experiences of redness are going to be different instantiations of redness with different hues, textures, shapes, etc., which means that redness gets associated with a large range of different qualia. If you come across a new qualia that seems to more closely match previous experiences associated with redness rather than orangeness (for example), I would argue that this is because the brain has assigned a higher probability to that qualia being an instance of redness as opposed to, say, orangeness. And the brain may very well test a hypothesis of the qualia matching the concept of redness versus the concept of orangeness, and depending on your previous experiences of both, and the present context of the experience, your brain may assign a higher probability of orangeness instead. Perhaps if a red-orange colored object is mixed in with a bunch of unambiguously orange-colored objects, it will be perceived as a shade of orange (to match it with the rest of the set), but if the case were reversed and it were mixed in with a bunch of unambiguously red-colored objects, it will be perceived as a shade of red instead. Since our perception of the world depends on context, then the meanings we assign to words or concepts also depends on context, but not only in the sense of choosing a different use of a word (like Wittgenstein argues) in some language game or other, but also by perceiving the same incoming sensory information as conceptually different qualia (like in the aforementioned case of a red-orange colored object). In that case, we weren’t intentionally using red or orange in a different way but rather were assigning one word or the other to the exact same sensory information (with respect to the red-orange object) which depended on what else was happening in the scene that surrounded that subset of sensory information. To me, this highlights how meaning can be fluid in multiple ways, some of that fluidity stemming from our conscious intentions and some of it from unintentional forces at play involving our prior expectations within some context which directly modify our perceived experience. 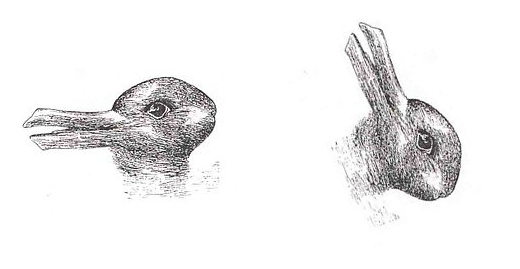 This can also be seen through Wittgenstein’s example of what he calls a duckrabbit, an ambiguous image that can be perceived as a duck or a rabbit. I’ve taken the liberty of inserting this image here along with a copy of it which has been rotated in order to more strongly invoke the perception of a rabbit. The first image no doubt looks more like a duck and the second image, more like a rabbit. Now Wittgenstein says that when one is looking at the duckrabbit and sees a rabbit, they aren’t interpreting the picture as a rabbit but are simply reporting what they see. But in the case where a person sees a duck first and then later sees a rabbit, Wittgenstein isn’t sure what to make of this. However, he claims to be sure that whatever it is, it can’t be the case that the external world stays the same while an internal cognitive change takes place. Wittgenstein was incorrect on this point because the external world doesn’t change (in any relevant sense) despite our seeing the duck or seeing the rabbit. Furthermore, he never demonstrates why two different perceptions would require a change in the external world. The fact of the matter is, you can stare at this static picture and ask yourself to see a duck or to see a rabbit and it will affect your perception accordingly. This is partially accomplished by you mentally rotating the image in your imagination and seeing if that changes how well it matches one conception or the other, and since it matches both conceptions to a high degree, you can easily perceive it one way or the other. Your brain is simply processing competing hypotheses to account for the incoming sensory information, and the top-down predictions of rabbitness or duckness (which you’ve acquired over past experiences) actually changes the way you perceive it with no change required in the external world (despite Wittgenstein’s assertion to the contrary). At what point do we stop seeing a picture of a chimpanzee and start seeing a picture of something else? When do we first see Bill Clinton? What if I expanded this series of 15 images into a series of 1000 images so that this transition happened even more gradually? It would be highly unlikely to pick the exact same point in the transition two times in a row if the images weren’t numbered or arranged in a grid. We can analogize this phenomenon with an ongoing problem in science, known as the species problem. This problem can be described as the inherent difficulty of defining exactly what a species is, which is necessary if one wants to determine if and when one species evolves into another. This problem occurs because the evolutionary processes giving rise to new species are relatively slow and continuous whereas sorting those organisms into sharply defined categories involves the elimination of that generational continuity and replacing it with discrete steps. 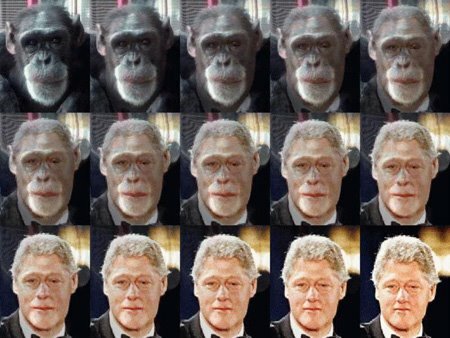 And we can see this effect in the series of images above, where each picture could represent some large number of generations in an evolutionary timeline, where each picture/organism looks roughly like the “parent” or “child” of the picture/organism that is adjacent to it. Despite this continuity, if we look at the first picture and the last one, they look like pictures of distinct species. So if we want to categorize the first and last picture as distinct species, then we create a problem when trying to account for every picture/organism that lies in between that transition. Similarly words take on an appearance of strict categorization (of meaning) when in actuality, any underlying meaning attached is probabilistic and dynamic. And as Wittgenstein pointed out, this makes it more appropriate to consider meaning as use so that the probabilistic and dynamic attributes of meaning aren’t lost. Now you may think you can get around this problem of fluidity or fuzzy boundaries with concepts that are simpler and more abstract, like the concept of a particular quantity (say, a quantity of four objects) or other concepts in mathematics. But in order to learn these concepts in the first place, like quantity, and then associate particular instances of it with a word, like four, one had to be presented with a number of experiences and infer what was common to all of those experiences (as was the case with redness mentioned earlier). And this inference (I would argue) involves a probabilistic process as well, it’s just that the resulting probability of our inferring particular experiences as an instance of four objects is incredibly high and therefore repeatable and relatively unambiguous. Therefore that kind of inference is likely to be sustained no matter what the context, and it is likely to be shared by two individuals with 100% semantic overlap (i.e. it’s almost certain that what I mean by four is exactly what you mean by four even though this is almost certainly not the case for a concept like love or consciousness). This makes mathematical concepts qualitatively different from other concepts (especially those that are more complex or that more closely map on to reality), but it doesn’t negate their having a probabilistic attribute or foundation. Though this discussion of language and meaning is not an exhaustive analysis of Wittgenstein’s Philosophical Investigations, it represents an analysis of the main theme present throughout. His main point was to shed light on the disparity between how we often think of language and how we actually use it. When we stray away from the way it is actually used in our everyday lives, in one form of social life or other, and instead misuse it such as in philosophy, this creates all sorts of problems and unwarranted conclusions. He also wants his readers to realize that the ultimate goal of philosophy should not be to try and make metaphysical theories and deep explanations underlying everyday phenomena, since these are often born out of unwarranted generalizations and other assumptions stemming from how our grammar is structured. Instead we ought to subdue these temptations to generalize and subdue our temptations to be dogmatic and instead use philosophy as a kind of therapeutic tool to keep our abstract thinking in check and to better understand ourselves and the world we live in. Although I disagree with some of Wittgenstein’s claims about cognition (in terms of how intimately it is connected to the external world) and take some issue with his arguably less useful conception of meaning, he makes a lot of sense overall. Wittgenstein was clearly hitting upon a real difference between the way actual causal relations in our experience are structured and how those relations are represented in language. Personally, I think that work within philosophy is moving in the right direction if the contributions made therein lead us to make more successful predictions about the causal structure of the world. And I believe this to be so even if this progress includes generalizations that may not be exactly right. As long as we can structure our thinking to make more successful predictions, then we’re moving forward as far as I’m concerned. In any case, I liked the book overall and thought that the interlocutory style gave the reader a nice break from the typical form seen in philosophical argumentation. I highly recommend it! This entry was posted in Cognition, Cognitive Science, Dogmatism, Epistemology, Knowledge, Linguistics, Logic, Metaphysics, Ontology, Philosophy, Sociology, Thought, Uncategorized and tagged associations, causal relations, Cognition, Epistemology, Language, Linguistics, meaning, meaning is use, Philosophical Investigations, Philosophy, probability, semantics, Wittgenstein by Lage. Bookmark the permalink.